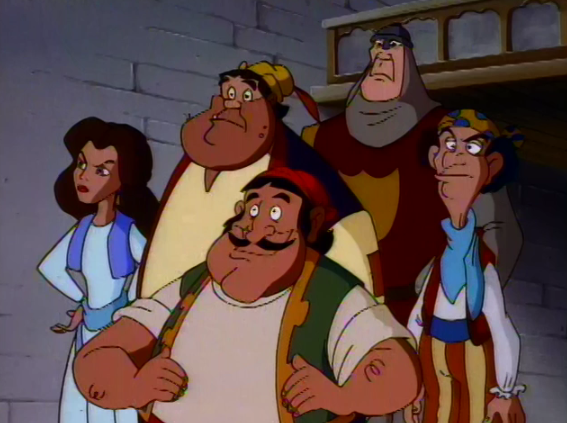 Instead of having a Clopin character or even a desginated Court of Miracles, The Secret of the Hunchback with have three thieves/entertainers that Esmeralda hangs out with and whom she doesn’t seem to care. First we have the leader, who doesn’t have a name, a dumb fat one who is named Andre and the other one. Basically they steal and get into Lord Frollo’s gang. 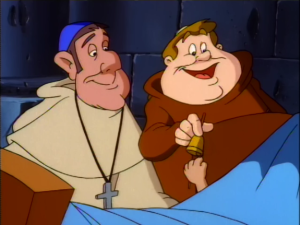 Frollo has them do his dirty work like kidnap Quasimodo and then has them pose as the Archdeacon. As Far as personalities go, they are goofy and not to nice. They like stealing and work under Frollo do to him threatening them and Esmeralda. But they don’t have any sense of a moral compass, so they don’t mind doing Frollo’s work. They do add a little bit to Esmeralda’s character, as she doesn’t like all the stealing but we don’t know how or why Esmeralda fell in with them, so it doesn’t REALLY all that much. Really these character are more for silly bad comic relief like Frollo’s other minion, who is really a Le Fou Rip-off.